Most organizations are failing miserably when it comes to their diversity and inclusion efforts. The reason: there are fundamental flaws in how most organizations approach diversity & inclusion (D&I), including how they are approaching unconscious bias. The major problem is that the emphasis is on diversity, rather than inclusion. The true competitive advantage of D&I can’t be achieved without a significant focus on inclusion. An organization can only capitalize on its diverse workforce if they are able to leverage those diverse viewpoints and experiences in their decision-making. The organization needs to create an environment where individuals feel comfortable expressing their diversity of experiences and thought and where the organizations both listens and leverages that diversity, in the decision-making process. When an organization creates an inclusive culture, they have more effective problem-solving, decision-making, and innovation – leading to long-term profitability. However, to achieve inclusion, you need to build connections around similarities, not differences, and this is where most organizations are getting it wrong. The goal of most D&I efforts is to cultivate a culture and environment that encourages and supports diversity. In addition to the many societal reasons why this is important, there is also a significant business case for D&I. 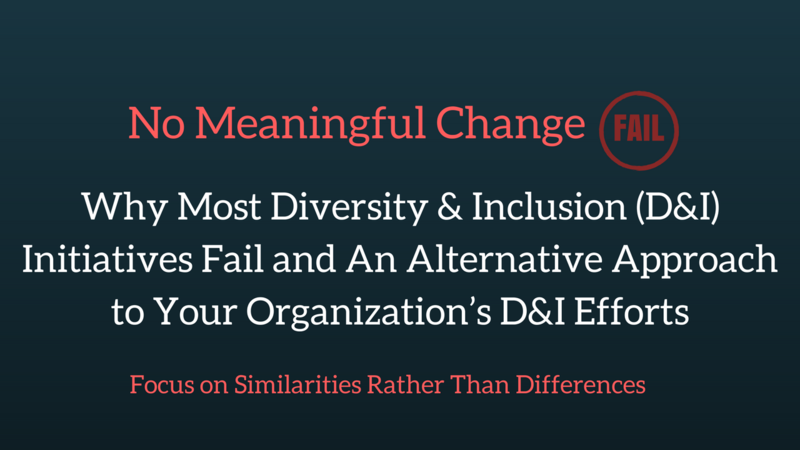 In the last 25 years, D&I has come to the forefront of conversation in many organizations. This is due to the changes and trends in demographics, in both the customer and human capital (i.e. – employees) market, and the impact on an organization’s sustainable competitive advantage. The demographic make-up of the United States has been changing – there is a significant shift from having buying power and influence concentrated in the white male demographic (historically this group has more economic and political influence than other groups) to other demographics – women, people of color, LGBT, disabled, etc. In simple terms, businesses do not exist without customers and if your customer base is changing, you need to understand and meet the needs of this changing customer base, or your business will fail. Therefore, most organizations understand that to sustain competitive advantage, your internal employee population should be reflective of this changing customer base and talent pool. • There is a statistically significant correlation between a more diverse leadership team and a company’s financial performance. Companies in the bottom quartile for both gender and ethnic/ cultural diversity were 29% less likely to achieve above-average profitability than were all other companies in the McKinsey data set. Even though many companies understand the significant business case for building a more diverse and inclusive workforce, the reality is that most of their efforts result in little to no significant change. D&I efforts have evolved over time - with an early focus on compliance with the current view as being a key component of an organization’s business strategy. In the early days, diversity efforts (inclusion was a term added much later) was often confused with affirmative action, and the terms were often used interchangeably. Consequently, D&I often suffers (including present day) from some of the negative perceptions surrounding affirmative action. In the US, corporate America was historically dominated by white males, so early diversity efforts were focused on increasing the representation of women and minorities. Early training programs, such as encounter groups and sensitivity training began as a reaction to the civil rights movement of the 1960s. These training programs were intended to foster open discussions about race relations, but often had elements of shaming the white males for benefitting from a historic bias of power, privilege, and influence. These early sensitivity-awareness training efforts were often programs that an HR officer hired an outside consultant or trainer to conduct, and success metrics were based heavily on the number of people who completed the training (or butts in seats). These efforts did not help but rather garnered significant backlash and later evolved to an expanded view of diversity, more commonly known as cultural diversity, and ultimately into a more encompassing view of diversity and inclusion. Diversity and inclusion efforts have come a long way since then, with many large companies today having more comprehensive approaches to diversity and inclusion and often an in-house chief diversity officer. Organizations often have many D&I initiatives in place including affinity groups or employee-resource groups, unconscious bias training, leadership development programs for women or people of color, mentoring programs, and recruitment efforts. The more progressive organizations have evolved from just diversity and inclusion initiatives or programs and are taking a more systemic look at the culture – systems, structures, processes, and behaviors that support or inhibit diversity and inclusion. Over 350 CEOs of the world’s leading companies and business organizations have signed a pledge called the CEO Action for Diversity & Inclusion™ to signify their commitment to advance diversity and inclusion within the workplace. Yet for all the resources spent, time and money, why is the rate of change so slow? Unfortunately, many companies’ diversity and inclusion efforts have done little to drive meaningful change. According to the Catalyst, Pyramid: Women in S&P 500 Companies (February 2, 2018), women are 44.7% of total employees, yet are only 5.2% of CEOS and 11% of top earners. Why do many of these initiatives fail to produce a real and significant change in organizations? There are several reasons why most organizations diversity and inclusion efforts are failing to produce significant change and realize the true competitive advantage of a diverse and inclusive workforce. The key to true competitive advantage can be found with inclusion and this is the area where most diversity and inclusion initiatives, including the three goals our 350 CEOs have committed to, are lacking. • Conversation is about diversity numbers and not inclusion: Being inside HR organizations and working with leaders for many years around diversity and inclusion, the conversation is almost always around improving diversity numbers and rarely about inclusion. Conversations are around increasing diversity in the early stages of the career and talent pipeline, often through campus recruiting efforts or by having hiring managers see a more diverse slate of candidates. It is seen as the responsibility of the HR Talent Acquisition team (i.e. the recruiters) to bring in diverse talent, but once they are brought it, they get lost in the system. If HR and leadership teams are looking at their metrics, (which is often a big “if”) then the focus is often on the number or percentage of diverse individuals (People of color or gender diversity) and diversity in the hiring slate. Retention and effective inclusion of diverse talent and diverse viewpoints is the harder conversation. It requires significant introspection on one’s company culture and a surgical and long-term approach to D&I. • D&I is seen as an HR, not business priority: The chief diversity officer, if a company has one, is often part of the HR leadership team. As a result, D&I is seen as an HR, not business priority. Many large companies put D&I as part of the HR agenda or people plan and hold HR accountable for the strategy and execution. What I have experienced at many large companies is that as the priorities of HR change, so does the focus and funding for D&I, as it is treated as a nice to have rather than a true business imperative. It needs to be a business priority that is sustained over time - not an item which shifts in priority each year on the HR agenda. • It lacks meaningful KPIs (key performance indicators) and OKRs (Objectives and Key Results) or even focuses on the wrong ones: Goals and measurement standards for D&I initiatives often lack the rigor that you see in other key business initiatives. Many organizations monitor and report on the activity of D&I initiatives rather than if they are accomplishing their stated goals. For example, many organizations spend significant time and resources on women’s leadership initiatives with the intention of increasing the representation of women in leadership positions. Yet many organizations don’t measure the effectiveness or return on investment of these initiatives and are not even aware if they are really doing anything to change the demographic make-up of the leadership ranks, let alone actually leverage that diversity. In fact, most of these initiatives are designed to “help” women and minorities to be more effectively “heard” by the dominant leadership (white male) population, rather than help the leadership teams to be more open to diverse and inclusive viewpoints. They create homogeneity, rather than leverage diversity and inclusion – which is the exact opposite of the business case for D&I. Unconscious Bias education: Organizations spend millions of dollars on diversity programs that make people aware that they have unconscious bias and hope that through this awareness we will have more diversity and equitable representation of women and minorities in our organizations. For the most part, these programs provide an education that people are biased in their decision making. They offer very few solutions on what to do about it, other than to be aware of it. The major problem is that you really can’t make people aware of their unconscious bias in the moment, because it is unconscious, or outside of your conscious awareness. I will talk more about this when I discuss an alternate approach. Affinity groups or employee-resource groups (ERGs): The terms are often used interchangeably, but there is a significant difference. An ERG is a business market-facing group that provides insight for accelerating business development activity, growing marketplace reach, and for providing growth ideas. 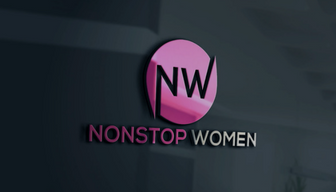 They are advisory groups which offer diverse perspectives on marketing techniques and business development, often for a market segment. Many organizations use the term ERG’s, but these groups really are affinity groups – internal employee groups that provide mentoring, networking and other opportunities as well as provide a safe space for people with common interests and issues to come together. The challenge or unintended outcome of the affinity groups (not true ERGs) is that it leads to a reinforcement of cultural differences and causes others outside the group to perceive that they are excluded, rather than included. The unintended consequence is that it can create a separate but equal, rather than an inclusive environment. Separate leadership development programs for women and/or People of Color: Intended to accelerate the readiness for women and People of Color to fill leadership positions in an organization, many organizations have separate development programs for women and/or People of Color. Often these programs are separate, one-off programs and not linked to the company’s overall leadership or talent development efforts. They often do not even teach the same skills that are discussed in the leadership programs. I have seen companies have completely different development assessments used for these programs, that are not aligned with the ones they are using as part of their talent management processes. These programs are often broad-based and generic around the topic of leadership and do not prepare the participants for key roles and responsibilities. They are rarely linked to succession management data about key roles. These programs are often positioned at the senior leadership level, with the intention to increase representation in the top 10% of the organization. Yet, little is done earlier in the pipeline, and often completion of these programs has little impact on succession management at the top 10%. While participants enjoy the experience, they are often frustrated when they are not promoted or placed in larger roles, and in some cases, you have a greater risk of turnover. This is coupled with the issue that the effectiveness and impact of these programs, other than participant satisfaction and the number of participants who attend, is rarely measured. Many organizations don’t measure the effectiveness or return on investment of these initiatives and are not even aware if they are really doing anything to change the demographic make-up of the leadership ranks, let alone actually leverage that diversity. In fact, many of these leadership programs are designed to “help” women and People of Color to be more effectively “heard” – i.e. increasing executive presence or confidence - by the dominant leadership (white male) population, rather than help the leadership teams to be more open to diverse and inclusive viewpoints. This causes the leaders to fit more into the existing model of leadership at a company and creates homogeneity, rather than leverage diversity and inclusion – which is the exact opposite of the business case for D&I. Again, the true competitive advantage is not just with a better representation of visible diversity but with a true inclusion of diversity of thought and perspective. A piecemeal approach to D&I initiatives rather than a comprehensive and holistic approach to culture change: Most organizations have a piecemeal approach to D&I that often consists of a few initiatives as part of the HR/people agenda. It is seen as more of a check the box that the company is supporting diversity and inclusion, rather than a comprehensive and holistic approach to culture change. This piecemeal approach is illustrated by the three goals our 350 CEOs have committed to – there is no holistic culture change, but instead a vague commitment to continuing conversations around diversity and inclusion (we have been having those since the 60s), implement unconscious bias education (we already talked about the flaws in most organizations unconscious bias education), and share best – and unsuccessful – practices (most companies already share best practices). To realize the competitive advantage of D&I, the company culture needs to embrace inclusion at all levels and all forms – from different gender, race, ethnicity, sexual orientation, socioeconomic class to differences in politics and thought. It is not easy, nor is it fast, but requires continued focus and change over time. It requires organizations to truly live by the mission and values they hang on their walls. The underlying challenge of creating a more diverse and inclusive workforce lies in the challenge of unconscious bias. To create an alternative and more impactful approach to fostering a diverse and inclusive workforce, we must begin with the root cause, which is unconscious bias. The problem is that most organizations address this through some type of awareness education on unconscious bias. Unfortunately, being aware of unconscious bias does not very little to mitigate its impact, as, by its very nature, it is unconscious and outside of one’s awareness. Even the use of the word bias creates a very negative perception and pits one group against another. Another way to think of unconscious bias is to view it as the brain’s decision-making heuristics or mental short-cuts, which it really is. Our brains are wired to take short-cuts in our decision making, as it is too taxing and takes up too much energy to truly process every decision. Our brain speeds this up by relying on heuristics (another way to think of a heuristic is it is a mental “hack”). These heuristics or hacks make us more effective and productive overall (this point is often lost in most unconscious bias programs). The brain relies on these mental strategies to simplify things, so we don't have to spend large amounts of time analyzing everything to its smallest detail. These heuristics have an evolutionary advantage for survival and can be found throughout the animal kingdom. When an animal meets a new animal, they do not analyze the situation, but quickly classify the new animal as friend, foe, or food, and act accordingly. As humans, at some level, we do the same thing when we meet new people. For years, psychologists have found that people naturally gravitate and prefer people who are like them. It is the in-group bias. The research has also found that we unconsciously discriminate against those that are not like us – the out-group bias and it is this unconscious classification of people into the outgroup, that can lead to bias and exclusion. Humans favor and have a more natural affinity for people who they view as in their in-group. However, they also see the out-group as a threat, on an unconscious level. So how do we create a more inclusive environment which fosters and celebrates differences, when the brain naturally classifies people who are different from us into the out-group? The answer lies in finding greater commonalities and similarities, rather than focusing on differences, so we naturally see people as in our in-group, and we include them. You want to use the in-group bias and the similarity principle - we associate things (including people) into groups if they are perceived to be like one another, and we like people who are more similar to us (whether that similarity is opinion, personality, background or lifestyle) – to foster inclusion rather than exclusion. When we focus heavily on visible differences, we miss the opportunity to connect with people on different and deeper levels as human beings. When we connect with people on deeper levels we allow our brain to see them as “like us” and not a threat. The problem is that most D&I initiatives have an emphasis on the differences rather than the similarities among groups, and as a result further fosters the in-group/out-group (us. vs. them) dynamic. Luckily, as an individual human, especially inside an organization, our group membership is multi-faceted. It is the multi-faceted nature of our group memberships which gives us many ways to build connections based on similarity (opinion, personality, background or lifestyle). As an individual, we are members of many different groups. Dr. Clay Alderfer and his pioneering work on Embedded Intergroup Relations theory identified the two basic categories of groups that people belong to; Identity groups and Organizational groups. Identity groups are made up of people who have some common biological factors (ex: race, gender), have been part of some similar historical experience (ex: 9/11 survivor), or have experienced social forces resulting in similar worldviews (ex: socioeconomic class) (Alderfer, 1982). Organizational groups are made up of people who share common positions within an organizational context or have similar experiences and viewpoints (ex: management, union, executive, grade level, etc.). The challenge of most D&I initiatives is that they focus heavily on identity group memberships while excluding the full range and appreciation of the diversity in thought and perspective that everyone brings to the table. The diversity of thought is a result of our multiple group memberships, and the true competitive advantage of diversity and inclusion comes when we can leverage those diverse viewpoints and experiences in our decision-making. The way to do this is to expand who is perceived to be in the “in-group” so that their differing opinion can be heard, valued and respected. If you relate to people on the highest level of group membership, (ex: humans), you change who is perceived as being in the in vs. outgroup. Let me give you an example: Today in the US, we are a nation of many different identity groups – different races, gender, sexual orientation, political party, etc. These are sub-groups of “American”, as we are all part of a larger group known as Americans, as we live in the US. If the US was attacked, we would not be talking about the different sub-groups (men vs. women, Democrats vs. Republicans), as we would unite under our common similar group, “Americans”. Being an American becomes the similarity between the various other identity groups. These sub-groups are no longer “out-groups”, as we are all part of a larger group, “Americans”. We identify at a country and patriotic level. The way to get people to relate to each other at this highest level as fellow human-beings is to emphasize the similarities, not the differences between us. The more we feel that another human being is ‘like-us” – we have a common ground to have conversations, build relationships and develop trust – the more likely we are to listen, respect and consider their diverse opinion as part of our decision-making process. There are many things that organizations can do on a macro and micro level to help build stronger relationships and enable people to see others as “similar to themselves” (aka a friend) and view them as part of their in-group. On a micro or team level, managers can promote true team-building (also a great way to utilize an existing organizational group), that fosters people to learn about others on their team in a deeper way – one that enables people to find and see commonalities rather than differences in opinion, personality, background or lifestyle. This helps to create strong relationships, where people know, like and even trust others, on their team and in their organization. An inclusive workforce is the result of those relationships, and it is only through inclusion, that an organization can realize the true competitive advantage of its diversity. If you want to learn more or discuss ways to help your team or organization realize the competitive advantage of diversity and inclusion, contact us and we can discuss ways to best meet your unique needs. You can also connect with me on Twitter, Facebook, and LinkedIn.